Wigan bounced back from conceding 10 goals in two Premier League games to ease past League One Hartlepool and into the Carling Cup third round. Sam Collins turned Hugo Rodallega's free-kick into his own net to put Wigan ahead after only three minutes. Jordi Gomez doubled the lead when his stunning 25-yard free-kick crashed in off the underside of the bar. And Victor Moses ensured the score had a flattering look when he fired in from the edge of the box. Wigan's under-fire boss Roberto Martinez had made six changes to the side hammered 6-0 by Chelsea on Saturday and his players gave him the result he was looking for, even though the performance still left room for improvement. Martinez has goalkeeper Ali Al Habsi, on loan from Bolton, to thank for keeping his side ahead in the first half. Al Habsi had replaced Chris Kirkland in goal for Wigan and he pulled off a stunning fingertip save to deny Joe Gamble in the 28th minute. Paul Murray struck a dangerous, bobbling shot which Al Habsi did well to hold first time and he saved again from Gamble from a 25-yard drive. 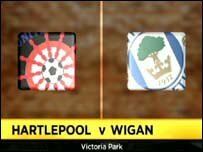 But Martinez made two changes in the 65th minute, introducing Victor Moses and James McCarthy for Rodallega and James McArthur respectively and that was enough to spur Wigan into life as they pressed on to put hard-working Hartlepool out of the competition. 93:24 The ref blows the whistle to start the match. 90:00+3:02 Defending throw-in by Steven Haslam (Hartlepool). 90:00+2:12 Hendry Thomas restarts play with the free kick. 90:00+2:12 Booking Gary Liddle goes into the book. 90:00+1:26 Victor Moses fouled by Gary Liddle, the ref awards a free kick. 90:00+0:03 Ben Watson takes a shot. Save by Scott Flinders. 90:00 The final whistle goes and the game is over. 88:21 Free kick awarded for a foul by Gary Liddle on Jordi Gomez. Emmerson Boyce takes the free kick. 85:21 Assist by Jordi Gomez. 85:21 GOAL - Victor Moses:Hartlepool 0 - 3 Wigan A goal is scored by Victor Moses from just outside the penalty box to the bottom right corner of the goal. Hartlepool 0-3 Wigan. 82:15 Defending throw-in by Maynor Figueroa (Wigan). 81:45 Attacking throw-in by Maynor Figueroa (Wigan). 80:55 Free kick awarded for an unfair challenge on Hendry Thomas by Denis Behan. Ali Al Habsi restarts play with the free kick. 79:53 Attacking throw-in by Evan Horwood (Hartlepool). 78:36 Defending throw-in by Emmerson Boyce (Wigan). 78:06 Substitution (Wigan) makes a substitution, with Charles N'Zogbia coming on for Mauro Boselli. 76:50 Substitution Paul Murray goes off and Leon McSweeney comes on. 75:46 Assist on the goal came from Mauro Boselli. 75:46 GOAL - Jordi Gomez:Hartlepool 0 - 2 Wigan Jordi Gomez scores a goal direct from the free kick from a long way out to the top right corner of the goal. Hartlepool 0-2 Wigan. 74:53 Free kick awarded for an unfair challenge on Mauro Boselli by Gary Liddle. 72:24 Defending throw-in by Emmerson Boyce (Wigan). 71:22 Jordi Gomez produces a right-footed shot from just outside the box that misses to the right of the net. 69:39 Booking Ali Al Habsi is shown a yellow card for time wasting. 69:11 Goal kick taken long by Ali Al Habsi (Wigan). 68:55 The referee blows for offside. Scott Flinders takes the indirect free kick. 67:52 Corner taken by Jordi Gomez, Gary Liddle manages to make a clearance. 66:15 Substitution Denis Behan is brought on as a substitute for Adam Boyd. 65:00 Substitution Hugo Rodallega leaves the field to be replaced by Victor Moses. 65:00 Substitution James McCarthy on for James McArthur. 63:39 Attacking throw-in by Emmerson Boyce (Wigan). 61:21 Corner from the right by-line taken by Ben Watson, free kick awarded for an unfair challenge on Steven Haslam by Steven Caldwell. Scott Flinders restarts play with the free kick. 60:10 Corner taken right-footed by Ben Watson, Antony Sweeney makes a clearance. 59:52 Hugo Rodallega takes a shot. Gary Liddle gets a block in. 57:56 Attacking throw-in by Evan Horwood (Hartlepool). 56:32 Substitution James Brown leaves the field to be replaced by Colin Larkin. 55:01 Free kick awarded for a foul by Andy Monkhouse on Jordi Gomez. Hendry Thomas restarts play with the free kick. 52:47 Adam Boyd challenges Antolin Alcaraz unfairly and gives away a free kick. Ali Al Habsi takes the free kick. 51:20 Attacking throw-in by Evan Horwood (Hartlepool). 48:00 Attacking throw-in by Steven Haslam (Hartlepool). 46:45 Inswinging corner taken by Joe Gamble from the left by-line, Emmerson Boyce makes a clearance. 45:22 Defending throw-in by Hugo Rodallega (Wigan). 45:00+0:56 Evan Horwood takes a shot. 45:00+0:25 Joe Gamble fouled by Hendry Thomas, the ref awards a free kick. Steven Haslam crosses the ball in from the free kick, Steven Caldwell manages to make a clearance. 45:00 The match has reached half-time. 43:02 Defending throw-in by Maynor Figueroa (Wigan). 41:24 Inswinging corner taken left-footed by Evan Horwood from the right by-line, Header on goal by Andy Monkhouse from inside the box goes harmlessly over the target. 39:23 Defending throw-in by Maynor Figueroa (Wigan). 39:08 Inswinging corner taken right-footed by Evan Horwood, clearance made by Antolin Alcaraz. 38:14 The official flags Hugo Rodallega offside. Scott Flinders restarts play with the free kick. 35:08 Paul Murray has an effort at goal from just inside the box that misses to the left of the target. 32:20 Free kick awarded for a foul by Sam Collins on Mauro Boselli. Jordi Gomez takes the free kick. 27:35 Shot by Adam Boyd from outside the box goes high over the crossbar. 26:39 Joe Gamble takes a shot. Save made by Ali Al Habsi. Inswinging corner taken by Gary Liddle, clearance by Steven Caldwell. 24:11 Jordi Gomez takes a shot. Save by Scott Flinders. 22:48 Attacking throw-in by Emmerson Boyce (Wigan). 22:11 Antony Sweeney takes a shot. Ali Al Habsi makes a comfortable save. 20:44 Corner taken by Evan Horwood from the right by-line, Hugo Rodallega makes a clearance. 19:37 Free kick taken by Joe Gamble. 19:37 Booking James McArthur is shown a yellow card for unsporting behaviour. 18:56 James McArthur challenges Gary Liddle unfairly and gives away a free kick. 18:22 Corner taken by Evan Horwood, Antolin Alcaraz manages to make a clearance. 17:58 Attacking throw-in by Sam Collins (Hartlepool). 17:31 Attacking throw-in by Sam Collins (Hartlepool). 15:09 Attacking throw-in by Evan Horwood (Hartlepool). 13:21 Paul Murray takes a shot. Ali Al Habsi makes a save. 12:15 Unfair challenge on Maynor Figueroa by James Brown results in a free kick. Free kick taken by Maynor Figueroa. 9:48 Attacking throw-in by Emmerson Boyce (Wigan). 8:06 Attacking throw-in by Evan Horwood (Hartlepool). 6:51 Antolin Alcaraz concedes a free kick for a foul on Adam Boyd. Steven Haslam takes the free kick. 3:53 Corner from the right by-line taken by Evan Horwood, save by Ali Al Habsi. 2:36 GOAL - Sam Collins:Hartlepool 0 - 1 Wigan Own goal by Sam Collins. Hartlepool 0-1 Wigan. 2:34 Assist by Jordi Gomez. 2:04 Hugo Rodallega fouled by Paul Murray, the ref awards a free kick. Free kick crossed left-footed by Jordi Gomez. 0:50 James Brown fouled by Steven Caldwell, the ref awards a free kick. Paul Murray restarts play with the free kick, Long range effort by Evan Horwood goes wide right of the net. 0:27 Attacking throw-in by Steven Haslam (Hartlepool). 0:06 Effort on goal by Mauro Boselli from long range goes harmlessly over the bar.